The PSJ120 12V MAX women's heated jacket is a high quality rain and wind resistant work jacket conveniently powered by the Bosch 12V MAX power tool battery system. Featuring three simple push-button heat settings - high, medium and low - the PSJ120 starts warming in seconds and is the perfect jobsite solution for the cold weather. Five (5) pockets, including a cell phone, large document, battery holster/controller, and two hand pockets, make storage on the go quick and easy. With the included BHB120 and Bosch 12V MAX battery, you not only can power the PSJ120, but can also power most USB port compatible personal electronics, such as cell phones, at the same time. You can have it all; warmth and back-up power. During the warm months, the BHB120 offers a convenient belt clip for use without your jacket simply as a power boost or back-up, anytime and anywhere with a Bosch 12V MAX battery. Engineered to battle the jobsite and survive the elements, Milwaukee's Hooded Jacket is built for tradesman who cant let cold slow them down. Focused on providing reinforcement in areas where traditional workwear fails, GridIron 900 Denier Ripstop Polyester Outlasts 12oz cotton duck by 3X against abrasion and tearing. Combined with large riveted and reinforced utility pockets and a tarnish resistant metal zipper, this jacket wont quit before the day is over. FreeFlex Mobility Gussets across the back and a fitted hood designed to provide full range of vision make sure that the Milwaukee<sup></sup> Hooded Jacket wont get in the way of the work on a cold weather job. 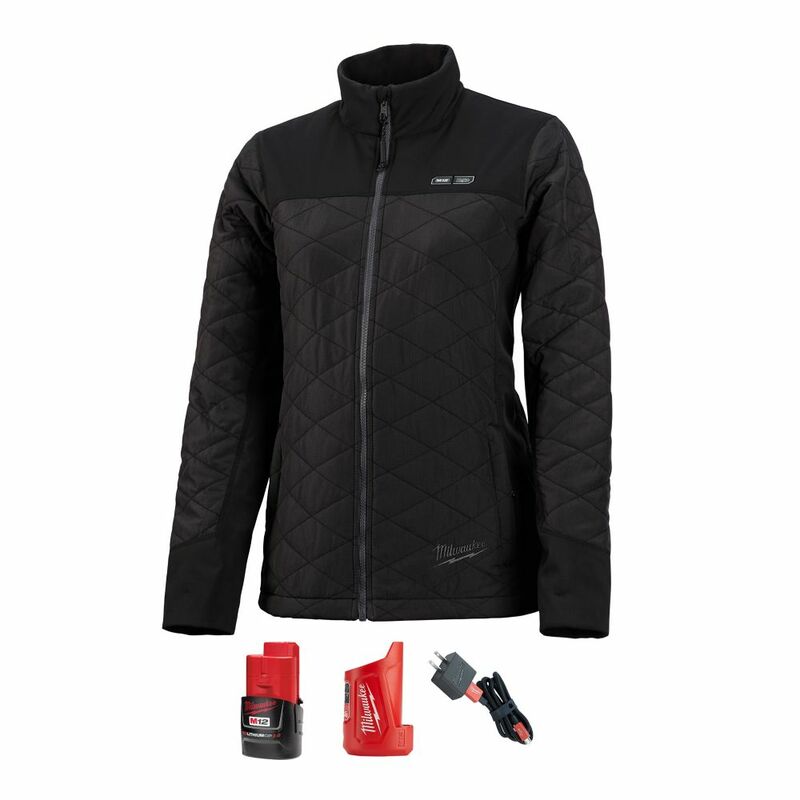 Women's Medium M12 12-Volt Lithium-Ion Cordless AXIS Black Heated Quilted Jacket w/ 2.0Ah Battery The women's MILWAUKEE M12 Heated AXIS jacket kits are designed to protect from cold and weather on the jobsite. Powered by M12 REDLITHIUM Battery Technology, these heated jacket kits use carbon fiber heating elements to create and distribute heat to the chest, back and shoulders. A single touch LED controller heats up the battery heated jacket to three heat settings, creating a comfortable heat for any environment. This MILWAUKEE heated jacket kit has a new Quick-Heat function that creates and distributes heat three times faster than our previous women's jackets and market competitors. Hybrid AXIS Ripstop Polyester provides a lightweight, compressible design that can be used as an outer shell or a mid-layer jacket and provides wind and water. This kit comes with one heated women's jacket, an M12 battery and charger. Women's Medium M12 12-Volt Lithium-Ion Cordless AXIS Black Heated Quilted Jacket w/ 2.0Ah Battery is rated 4.1 out of 5 by 55. Rated 3 out of 5 by GM1 from I love this jacket but it runs incredibly small for a woman's body. I first bought the medium fo... I love this jacket but it runs incredibly small for a woman's body. I first bought the medium for a size 6 woman but had to get a large. That gives her just enough room to work and be able to move easily. If I had a do over I would have bought the men's version for her. It's a great looking jacket just overly small for the sizing. Rated 5 out of 5 by Georges from Perfect for my spouse when during cold outdoor activities and... Perfect for my spouse when during cold outdoor activities and motorcycling. Rated 5 out of 5 by Snowmoon from This jacket is amazing. This jacket is amazing. Rated 5 out of 5 by Grumpyoldman from Bought for a friend that is always cold and she... Bought for a friend that is always cold and she loves it. Keeps her warm, fits well, only issue is location of battery pack when sitting in the back pocket is annoying. Rated 5 out of 5 by minimedic2004 from I love this jacket. It fits well, and warms... I love this jacket. It fits well, and warms up quickly. It is true to the size. I wish I had it earlier in this cold winter!